The quest for healthy and glowing skin has not ceased to this day. Women and even men make continuous efforts to keep their skin clear and healthy. Although lots of commercial products plague drugstores and cosmetic shops, these products are bound to have unwanted side effects. Commercially available organic products, though much safer and relatively better, also have drawbacks as there are only a few products to choose from and at a higher price tag at that! Because of these, people have learned to make their very own skin products at home instead of buying facial lotion. 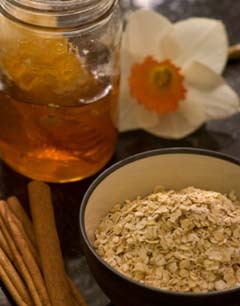 One of the most popular homemade skin foods are oatmeal face mask. Combine all the ingredients together to make a smooth paste. You may adjust the amount of water if it is too runny or too thick for you or you can add more oatmeal. Apply it to your face and let it stay for around 15 minutes. You may also apply it to your face and neck in circular motions if you don’t want a mask. Rinse it off with lukewarm water. Oatmeal not only leaves your skin softer but it also has exfoliating properties that can remove dirt and dead skin cells. Oatmeal is also known to remove excess oil from your face and has since been a popular natural remedy for acne. If you have oily skin, try to homemade oatmeal face mask to clean your skin. Filed Under: Blog Tagged With: oatmeal bath.